“Leopard Men” — vicious killers wearing leopard skins and gloves fitted with metal claws — have been featured in stories, books and movies since the 1930s. Their first big splash in pulp fiction was in the Edgar Rice Burroughs’ novel TARZAN AND THE LEOPARD MEN. It was initially serialized in BLUE BOOK magazine in 1932. 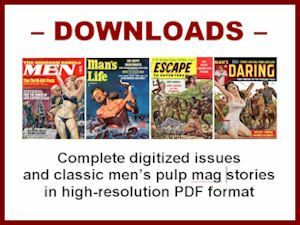 BLUE BOOK was one of the most influential and long-running pulp magazines. In 1960, as the traditional pulp magazine market faded away, it morphed into the men’s adventure magazine BLUEBOOK FOR MEN. TARZAN AND THE LEOPARD MEN was first published as a book in 1935, with a magnificent wraparound cover painting by J. Allen St. John. In the late ‘30s and the 1940s, Leopard Men showed up in other vintage pulp fiction magazines and novels, as well as in comic books and films. 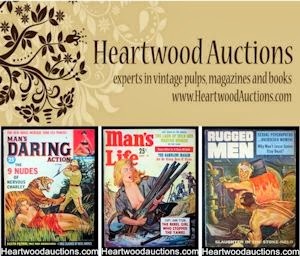 During the 1950s and 1960s, stories about Leopard Men — and Leopard Women — were fairly common in men’s adventure magazines. Some were fiction yarns. Some were portrayed as true stories. Either way, like the earlier pulp stories and movies about Leopard Men, they were all based partially on fact. Because at one time there really were Leopard Men in Africa. For background on those real life Leopard Men, watch the video about them on the Discovery Channel, or read the article about the Anioto Leopard Men of the Belgian Congo or this account of Leopard Men in Liberia. There’s also a classic history book about the Leopard Men cult, titled THE MAN-LEOPARD MURDERS: HISTORY AND SOCIETY IN COLONIAL NIGERIA. The Leopard Men were members of an African religious sect referred to as The Leopard Society. And, they were pretty damn scary. They actually did dress in leopard costumes and use gloves with iron or steel claws to slash and kill their victims. They were also into ritual sacrifice and cannibalism. They drank the blood of people they killed and ate their flesh and internal organs. The traditional victims of the Leopard Society were other tribal members. In addition to having religious purposes, ritual murders by Leopard Men were a way of punishing violators of tribal law and taking revenge on enemies. Some accounts suggest the Leopard Society was also a bit like an African version of the Mafia, since their members used murder and terror to gain power and wealth. During the latter decades of the colonial era, they were also portrayed as “terrorists” who targeted white colonial officials and settlers for murder, along with natives who cooperated with them. One of my favorite “true” stories about Leopard Men in a men’s pulp adventure mag is in the October 1955 issue of MAN’S MAGAZINE. The cover of that issue features a painting by the talented magazine and paperback cover artist Frank Cozzarelli, showing a Leopard Man sneaking up on a white hunter. The story itself, written by Murray T. Pringle, is illustrated with photos inside. 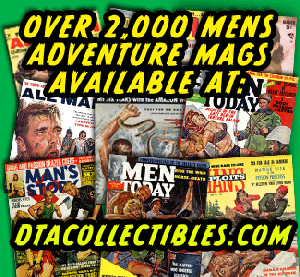 Pringle wrote stories for a number of men’s adventure magazines during the 1950s and 1960s. He also wrote for some of the last of the pulp magazines in the ‘50s, such as TEXAS RANGERS and RANCH ROMANCES. In the ‘60s, his stories appeared fairly regularly in BOY’S LIFE. Pringle’s Leopard Men story for MAN’S MAGAZINE was printed at a time when Kenya’s bloody Mau Mau uprising was generating a lot of international attention and fear. So, the subject of African “terrorists” was timely. Of course, like many “true adventure” stories in men’s pulp magazines, much of Pringle’s story is either highly embellished or outright fiction. “THE HUNTER knew there was something dead in the grove just ahead. The smell of death and decay hung fetidly in the heat-charged air of the Belgian Congo. The horrible stench grew stronger as he approached the trees. He entered the grove, took one long, incredulous look, then leaned weakly against a tree and vomited. An opening like that certainly made me want to keep reading. Here are scans of the two-page spreads for a couple I found recently. 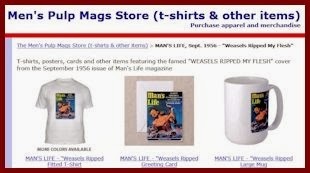 The one on the left is from MAN'S LIFE, July 1957 and features an early men’s adventure mag illustration by Vic Prezio. who went on to do hundreds more. The other, from TRUE ADVENTURES, October 1961, is by artist Bruce Minney. I had the honor of doing an interview with Bruce in 2011, two years before he passed away. I also posted excerpts from the great book about him BRUCE MINNEY: THE MAN WHO PAINTED EVERYTHING, by his son-in-law Tom Ziegler. 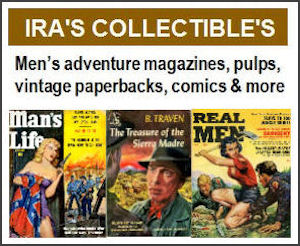 That’s one of the must have books for fans of men’s adventure magazines. R.I.P. Walter Kaylin ... One of the greats.